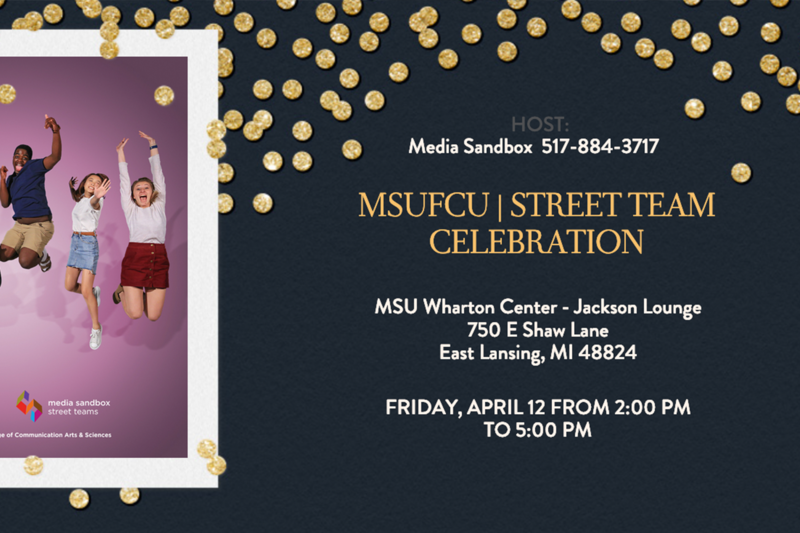 Join Media Sandbox and MSU Federal Credit Union for a celebration of Street Teams and their nonprofit partners. This will be a semi-formal event held in the Wharton Center Jackson Lounge from 2-5 p.m. on April 12th. Sandbox Street Teams are student-run, creative collaborations within the MSU College of Communication Arts & Sciences. Street Teams partner with nonprofits and develop creative solutions to communication challenges. MSUFCU helps these interdisciplinary groups of students expand their partnerships with local nonprofit organizations. Student participants benefit from real-world learning opportunities, while also giving back to the local community. Thank you to MSUFCU for their generous support!